The new deal with the Philippines has different motivations than Japan’s defense agreements with other states. On February 29, Japan and the Philippines signed a defense equipment transfer agreement, making the Philippines the first Southeast Asian country to sign such an agreement with Japan. Since Prime Minister Shinzo Abe and his government overhauled the framework for Japan’s arms exports by establishing a new Three Principles for Defense Equipment Transfer in April 2014, Japan has aggressively moved to sign defense equipment and transfer agreements with countries beyond the United States, its traditional ally. In July 2013, Britain was the first non-U.S. country to sign such an agreement with Japan, followed by Australia (July 2014) and India (December 2015). These agreements have been primarily driven by the Japan Ministry of Defense (JMOD)’s desire to internationalize its defense industry. The goal is to ensure that Japan will be able to maintain a defense industrial base that is robust and competitive enough to prevent Japan from becoming completely reliant on foreign defense industries. The agreement with Australia, for example, was clearly driven by Japan’s desire to create a favorable environment for a successful Japanese bid in Australia’s SEA1000 submarine modernization program. The Japanese government also hopes that the agreement with India will facilitate the long-standing discussion of transferring Japanese US-2 search-and-rescue aircraft to India. 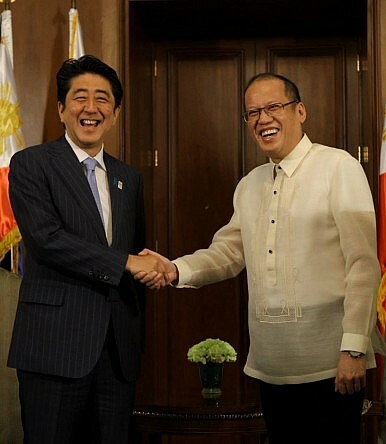 In contrast, Japan’s defense equipment transfer agreement with the Philippines is unique, due to the sense of urgency that drove the negotiation process. The agreements with the U.K., Australia, and India were pursued in the broader context of how to nurture Japan’s defense industry to improve its competitiveness, with the goal of JMOD getting a better bang for its buck in future defense acquisitions by diversifying cooperation on defense equipment and technology beyond the United States. However, last week’s deal with the Philippines is a more direct response to the accelerated pace with which China is solidifying its effective control of the disputed islands and features in South China Sea. China’s land reclamation activities have been proceeding quickly in the last several years, at a faster pace than the activities by other claimants in the South China Sea. In particular, China’s recent decision to place surface-to-air missiles on Woody Island in the Paracels and radar facilities in the Spratlys have attracted a great deal of international attention. The radar deployment, in particular, has been held up as the first explicit measure to “militarize” China’s reclaimed areas in South China Sea, despite Chinese President Xi Jinping’s assurances against such actions during his meeting with President Barack Obama in September 2015. The Philippines has brought the South China Sea disputes for arbitration at an international tribunal, which gave a preliminary ruling in favor of the Philippines by deciding it had jurisdiction to hear the case in October 2015. But China has already suggested that it will not honor the decisions made by the arbitral tribunal. Under these circumstances, there is a growing sense of urgency on the side of the Philippines that it needs all the help it can get to buttress its own capacity in the area of maritime security. The defense equipment and technology transfer agreement between Japan and the Philippines was signed in this context. Japan has already identified — both in its National Security Strategy and National Defense Program Guidelines — that capacity-building in Southeast Asia is on Tokyo’s high-priority policy agenda. Prior to the establishment of the Three Principles of Defense Equipment Transfer in 2014, the focus of such capacity-building was on personnel training, transfer of non-defense equipment that can be useful in maritime security, and financial assistance that would allow the recipient countries to purchase necessary equipment. With the new guidelines for defense exports, Japan overcame an important domestic hurdle to including the transfer of defense equipment on the list of capacity-building activities. Last week’s agreement between Tokyo and Manila will no doubt facilitate such transactions. Already, the two countries are expected to hold consultations on Japan loaning Manila five used TC-90s, training aircraft from Japan Maritime Self-Defense Force (JMSDF). Once this arrangement is concluded successfully, it will set an important precedent that opens the door for Japan to discuss similar arrangements with other countries in Southeast Asia that can use such assistance to improve their maritime security capacities. More generally, the loan of used JSDF equipment can be an important pillar for Japan’s defense industrial policy. On the one hand, Japan can leverage its defense equipment and technology agreements with countries such as the United States, Britain, and Australia to identify and invest in its high-end, future capabilities. On the other hand, agreements with Southeast Asia and other partners involving used defense assets can be useful in creating potential business opportunities for the Japanese defense industry by offering to provide training for maintenance and repair, as well as continuing to produce the parts necessary to sustain the used equipment. If Japan can pursue such a dual approach in defense technology and equipment cooperation with its security partners, it will help Japan make positive contributions in the area of capacity-building while maintaining its own defense industrial base.